Econsultancy recently profiled a pizza shop that wanted to raise their profile in a very targeted area. The company's founders developed a YouTube channel that profiled their journey around Italy to learn to make the best pizza. 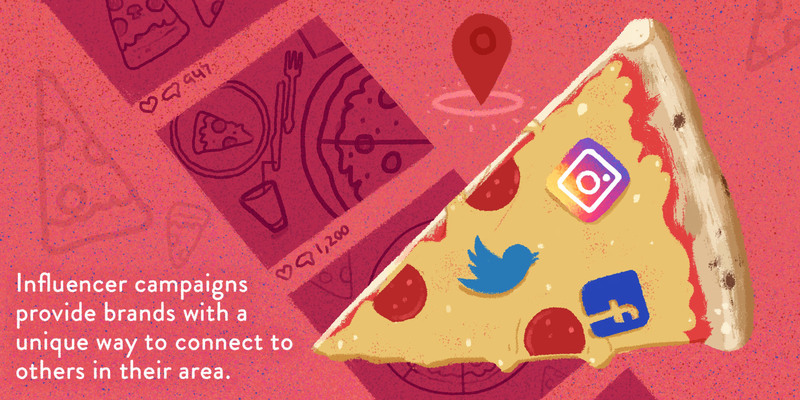 Upon their return to London, they tapped into influencer marketing to capture the attention of people within a mile of their Soho pizza shop. Their goal was to attract visits from people who lived and worked within a very close radius. Their focus was two-fold: to build relationships through ongoing campaigns, rather than one-off promotions, and to leverage influencers who specialized in their neighborhood. The company partnered with food bloggers and social media personalities who had a clear focus on Soho. They prioritized influencers with an active following and leveraged the partnerships through sponsored content, creating events that influencers could attend and promote, and offering discounts they could share with their followers. In many national campaigns, there's a big focus on follower numbers to maximize exposure—however, when you're focused on a narrower area, it's more important to find influencers with a specific geographic focus. For example, a Soho-focused blogger with 1,000 engaged fans may yield more conversions for your brand than a London-wide influencer with 5,000 followers. Social Media Examiner reports on some location-based social monitoring tools you can use to find and engage with local influencers. Attaching yourself to local voice people trust can boost several location-based marketing KPIs. By targeting people nearby via your influencer, not only are you improving your audience reach, but with a relatable evangelist posting about your brand to people in the area, you're liable to see store visits and coupon redemption go up, as well. Influencer campaigns tend to be most effective when there's a clear objective. In some cases, you're working to get the word out about your brand. In others, you're trying to actively drive conversions or sell a specific product. Empowering local influencers to create value for their fans is a win–win. For example, a store might partner with an Instagrammer for a limited-time promotion. If fans visit the store and share a specific "password" with the clerk, they get 10 percent off their order. The influencer is giving back to their community, and you're providing the incentive for their followers to take action now. Another element that's important for working with influencers is to make sure that the influencer you're considering has a highly engaged audience. Ten thousand followers who never read, share, or act on a person's content ultimately have limited value. At the same time, it's also important to do a deeper analysis of their audience. If they're talking about your area to people in your area, that's a great start. Location data affords you the opportunity to know your audience—does their audience and way of communicating fit your demographic? For example, a casual diner might have limited success partnering with a local blogger focused on organic five-star dining experiences. Even in local campaigns, it's important to do a deeper analysis to ensure that your messaging and product will resonate. Influencer marketing generates an ROI 11 times greater than other digital marketing techniques. Local companies can experiment with influencer marketing by focusing on influencers who specialize in their geographic area. Choose influencers who have an engaged audience that matches your company's target demographic. Create campaigns and content that give followers incentive to act now, such as a coupon or discount.